There are many leafy vegetables (shaak) we cook in home. In fact in our country we get so many different leafy veggies and there are many ways of cooking them also. But in our family we have very few favourites; ‘Puin Shaak’ is one of them. 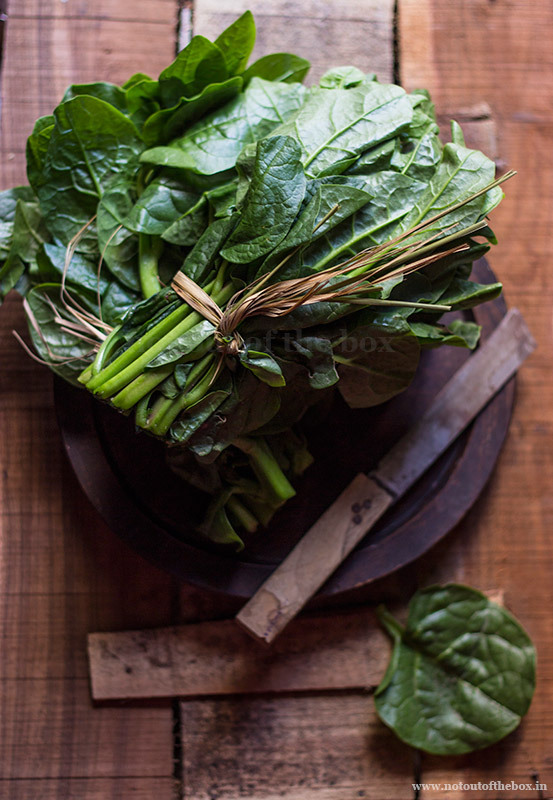 Pui Shaak er Chochhori is a Bengali way of cooking Malabar Spinach. This particular shaak has its own unique taste, which turns more delicious if cooked with prawns or fried fish heads, specially the head of Hilsa. I’ll share that recipe some day. We got a fresh bunch of Pui from our local farmers market few days back. And I had to cook this without adding any non-vegetarian thing, because I had nothing suitable that time in my freezer. But this vegetarian version of Pui Shaak has its own charm, and one large portion of rice can be easily polished off with this only. Adding onion and garlic into this was our personal choice. Onion-garlic gives a nice kick to this dish, but you can skip the onion-garlic part completely if you want to make a pure vegetarian version. Chop Pui Shaak roughly, keep the leaves and stem parts separate. Place them in a colander, wash well under running water. Please don’t mix the stems and leaves while washing. Keep aside. Cut eggplant, potatoes and pumpkin into cubes. Wash and keep aside. Cut the onion into thin slices. Heat ¼ cup mustard oil in a deep frying pan/kadai. Temper with the ingredients mentioned ‘for tempering’. Add sliced onion, sauté on medium flame until translucent. Next to add eggplant, potatoes, stems of pui shaak, pumpkin, ½ tsp of turmeric powder and salt. Mix. Cover and cook on medium flame for 4-5 minutes. Keep stirring in between. Add cumin powder, coriander powder, ginger paste, garlic paste and green chillies. Mix well, cover and cook for 4-5 minutes on low flame. Now add ½ cup of water into this. Mix, cover and cook on low flame. When the veggies are half cooked add pui leaves. Mix thoroughly, cover and cook until all the veggies are done. Add sugar, mix and cook uncovered for 2-3 minutes more. Your ‘Pui Shaak er Chochhori’ is ready to eat. 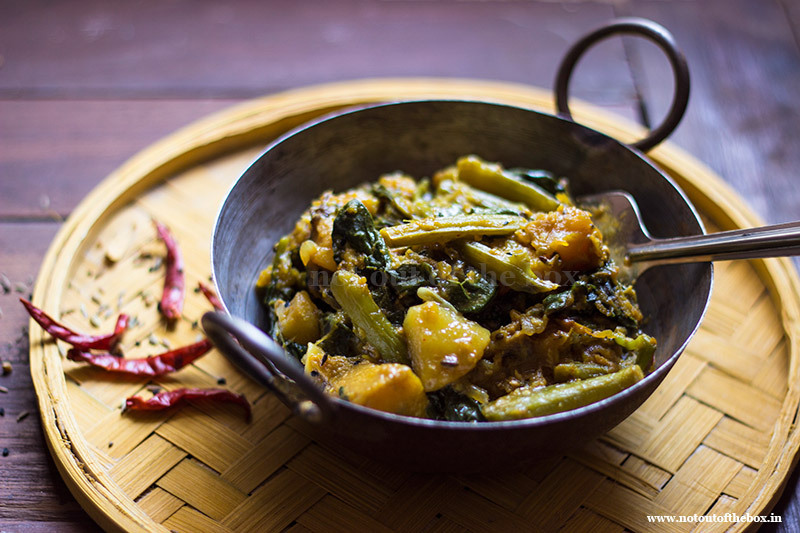 Serve hot as a side dish with steamed Rice and Dal. Enjoy! The consistency of this dish should be semi dry. The veggies will break slightly during the cooking and that is completely fine with this dish. I am really thakful to you ,because I have no idea about this dish. Hi ur description is nice n easy ,keep it up.looking frwd to alloo posto recipe although it’s quite an easy known dish but wud be delighted to get ur version .thanks. Thank you for the kind words. 🙂 Here is the Aloo Poshto recipe link, hope you’ll enjoy cooking it.